"The "Good" Impacts Progressive Web Apps Will Have On Your Business"
"How IoT Will Change Mobile App Development In 2019"
From buying clothes, appliances, toys and furniture to even renting services online using our smartphones with the help of a mobile application; we all know the significant role that the e-commerce sector plays in each of our lives. Today, technology is fast changing and rapidly developing. By looking back at the mobile applications we had a while ago and comparing those with what we have now, each of us would definitely be able to understand the changes. After we have viewed or purchased an item online, we get suggestions based on that frequently, we get a notification when a similar product's new model or there is any sale with an exciting offer. The e-commerce apps are constantly trying to fill up the pieces of what we want and are trying to show us what we want instead of telling it our requirement. All of this is the result of the technological advancements that are integrated with the e-commerce industry. Here in this write-up, we'll see 5 technology trends that you will see in 2019. It is nearly the mid of 2019. But the pace of growth at which technology is soaring and advancements are made is never going slower. 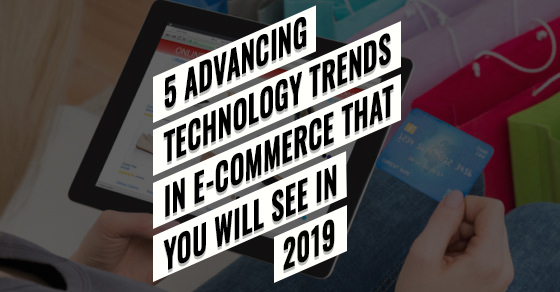 We'll take a look at the 5 major technology changes that will impact the e-commerce industry the most. Artificial intelligence (AI) is now a buzzword today. You hear it almost every time; associated with almost every industry. That is because its benefits and powers are endless. The same goes for the e-commerce industry. Today, several companies are working with, developing AI is trying hard to provide unique solutions for the e-commerce markets. With the use of AI in the e-commerce industry, the sellers could learn the users' behaviour and could easily suggest products or services that a particular user is more likely to buy. There are several AI companies that are continuously working on blurring the lines between brick-and-mortar retailers and online retailers. With more rapid developments in the field of AI, this boundary could be soon gone. Smartphones and mobile applications have changed the way sales happen in online markets. If the brick-and-mortar retailers are open for a certain period of time, the e-commerce markets are open 24/7. Over a period of time, there has been a drastic change in the number of sales taking place in the e-commerce sector. And this pace is not slowing down anytime sooner. Anticipating the user's requirements and sending him or her with the required products - can you imagine that happen? Like, before you know that you need a visit to the grocery store, all that you need is brought to you! Yes, many of the big e-commerce companies are working on similar projects, and soon enough that will happen. The biggest example is Amazon's "method and system for anticipatory shipping", which they patented in 2013. Earlier, if we only had payments from our debit or credit cards, today there are even a number of online payment services available. Some examples include Paytm, Amazon Pay, Google Pay etc. And this number is increasing. It is expected that soon enough, most users will completely change to making online transactions. The technological advancements are not slowing down and neither will be new trends in the e-commerce sector. In fact every day there is progress that will ultimately transform the e-commerce sector. Though the 5 points mentioned above will be the major trends in 2019, we'll still have to wait and see for ourselves, what more will come.